Along the way, Anno and Higuchi do eventually widen their perspective beyond that initial barrage of boardrooms and bureaucrats, and their vision of Godzilla is as terrifying, awe-inspiring, imaginative, and technically accomplished as any that have come before. The sequences of destruction are more visually arresting than any special effects extravaganza Hollywood has produced in years (including 2014’s Godzilla, an immaculately crafted film in its own right), and no matter how deep your history with the eponymous monster – a character so iconic and ubiquitous that all of us, whether or not we’ve seen any of the previous 28 Toho-produced films, have a clear image of him in our heads – Shin Godzilla will make you fear and wonder at the beast as though you are encountering him for the first time. This is no small feat, and if any film I have seen this year demands to be seen theatrically, on the biggest screen possible, it is this one (Funimation Films is presenting it in a limited theatrical run until October 18th). Yet throughout, the film’s heart remains in those boardrooms, in the sparse and sterile interior spaces where experts and politicians gather and decisions are made. The film has a central human protagonist and several prominent supporting players, all of whom have a clear and meaningful arc even though the film is simultaneously accommodating an ever-evolving cast that must number in the hundreds, but the individual viewpoint is never what matters most to Anno and Higuchi. For their protagonist is, in truth, Japan itself – the Japan of now, not of a fantasy, only distanced from our reality by the presence of Godzilla. This is the Japan that had its legs cut out from under it after the Pacific War, that became not only a pacifist nation, but one under the control (both direct and indirect) of numerous foreign powers. Godzilla has faced the Japanese military many times before. Anno and Higuchi are the first to point out that, under the nation’s postwar constitution – drafted under influence of occupying Allied forces – calling upon their own military powers is a significant legal hurdle. Ultimately, the story of this film is a vision of Japan awakening from a long political slumber, casting off the shackles of entrenched bureaucracy, pacifism, and external influence, roaring itself back into action to take the nation’s destiny into in its own hands. It is an intensely provocative vision, one that doesn’t just echo the country’s current debate over nationalism, but blows that debate apart and systematically lays out a stark alternate future for Japan’s global sociopolitical identity. The imagery of the film’s climax, in which the Japanese forces use their own infrastructure, architecture, transportation, and scientific development in a last-ditch effort against Godzilla, is powerfully symbolic, and irreducible to either a simple nationalist rallying cry or a pessimistic vision of destruction. As the modern Japanese government reexamines and reforms the extent and purpose of its nation’s military forces, and as cultural debates continue over the sanctity of the postwar constitution and the country’s place in the world, Shin Godzilla dares to force audiences into a direct confrontation with that immeasurably complex conversation. The United States has not produced a mainstream film this politically engaged with its own government and culture in my lifetime. Japan has, and the results are mesmerizing. Nor has Hollywood drawn this directly, or with such a clear and poignant sense of purpose, from its country’s own disasters. 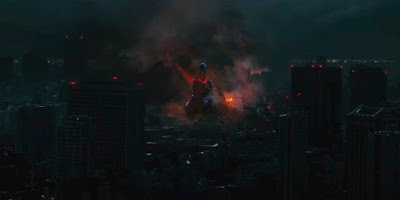 On the outside, it may seem obvious that Shin Godzilla would draw upon the 2011 Tōhoku earthquake and tsunami and the ensuing Fukushima Daiichi nuclear disaster, but until one actually watches the film – and unless one has some sense of the sheer horrors Japan experienced five years ago – it is impossible to fathom just how deeply Anno and Higuchi are willing to reopen and reexamine those still raw wounds. The images of disaster the directors conjure here are not purely fantasy, nor are they used as crass exploitation of tragedy for purposes of escapism (a la Zack Snyder’s appalling appropriation of 9/11 imagery in Batman v Superman). Even if they include a giant fictitious monster trampling through them, the images of flooded streets and collapsed buildings resonate because to Japan they are, in some sense, real, a disaster not from some far-off dystopia but from the nation’s recent past. And by carefully tracing every step in the government’s response to such a crisis, no matter how small or seemingly insignificant, Anno and Higuchi not only instill a sense of deserved fascination with the process of disaster response, but earn the right to present a vision of both that process and the political identity of the nation it represents morphing and evolving. Above all else, Shin Godzilla is an immaculately made film. It has so many layers of plot, character, theme, text, subtext, and symbolism working in harmony that it is operatically dense, and yet it move with such a nimble sense of identity and pace that it never once threatens to collapse under its own immense weight. Anno himself is credited as co-editor (alongside Atuski Sato), and the editing is indeed a monumental achievement, a masterclass in rapid-fire montage editing, moving between countless characters and locations without ever blurring its sense of rhythm of visual geography. The film is as dialogue-heavy as any produced since the advent of sound, and much of that dialogue is technical and dense. But the performances are so uniformly good – so committed to a sense of reality and immediacy, with every actor throwing in small, carefully observed character flourishes for good measure – and the pace and tone is so tight and on point that the film moves like a beast, rapid and tense and edge-of-your-seat from first frame to last, whether or not Godzilla himself is on screen. And when Godzilla is there? Holy cow. Strap yourself in. Even with two veterans of visionary anime and daikaiju mayhem at the helm, I was not prepared for just how insane Anno and Higuchi push things. It is not just the sheer extremity of Godzilla’s design – he is more enormous and imposing than ever, his craggy visage and pulsating body like something out of a fevered nightmare – but the unrelenting horror Anno and Higuchi allow him to unleash. When Godzilla is on screen, the film comes about as close as live-action can to entering the realm of anime, and if you think you’ve gotten the gist of what Anno and Higuchi are going for from the film’s trailers, you are likely unprepared for the visual insanity the film unleashes. This is the rare case where I am genuinely at a loss for how special effects pulled many of these images off, just as I am in awe of the sheer scale of the film’s production, or of the consistently purposeful and pointed cinematography. 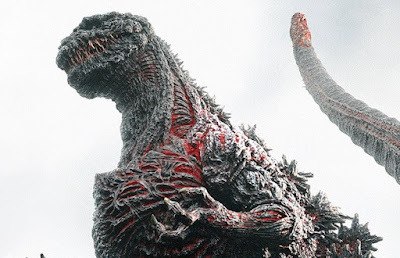 The film is, in a word, jaw-dropping, and while there are occasional missteps – certain original musical cues feel a tad out of place (though the film makes excellent use of Akira Ifukube’s original 1954 Godzilla score), and certain uses of the English language are going to feel inorganic to American audiences – the immensity of what Anno and Higuchi have accomplished is enough to easily render such minor imperfections immaterial. 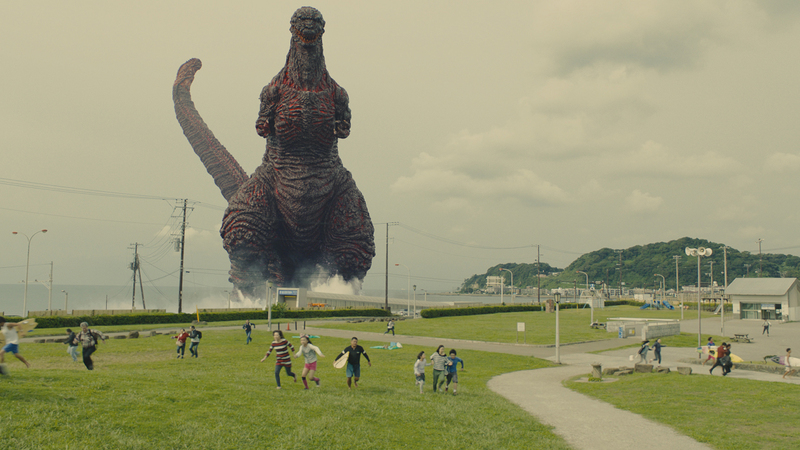 Shin Godzilla is a masterpiece, full stop, a symphonic achievement in filmmaking that is every bit as politically and socially engaged as the original Godzilla was 62 years ago. Films like these are a special rarity, no matter their country of origin; that Japanese filmmakers are uniquely able to channel their country’s tragedies and crises into astute, inventive, and entertaining works of filmic art, from the immediate postwar era all the way to now, speaks strongly to the nation’s ongoing cinematic legacy.